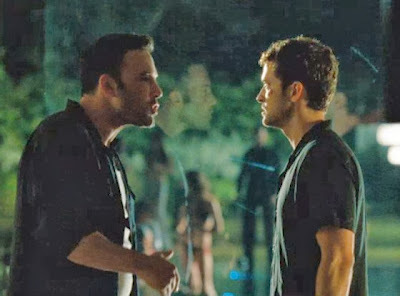 BIG SPENDERS: Affleck (left) and Timberlake in a scene from the new movie. The high price of playing fast and loose with credibility and integrity (not to mention the patience of your audience) is at the crux of Runner Runner, a slight new action thriller, with Justin Timberlake, Ben Affleck and Gemma Arterton (who make the most of their ungratifying roles) that takes you inside the sleazy world of casino gambling, money laundering and the ruthless underground realm of Costa Rican druglords. Timberlake, conveying a curious mix of cockiness and naivete, is Richie, a Princeton student with a gift for numbers and a taste big wagers, who is ensnared by a slippery casino boss named Ivan Block (Affleck), a sly fox who plays by his own rulebook. Arterton (Prince of Persia: The Sands of Time) is bonafide eye candy as the buxome brunette caught between the two. Things get heated for these power players when the FBI (led by a dogged agent played by Anthony Mackie) starts snooping around and reels in Richie in a scheme to topple Ivan's empire. The game quickly spirals into an every man-for-himself affair.